In order to take full advantage of djangocms-cascade, you should be familiar with the concepts of the Bootstrap Grid System, since all other Bootstrap components depend upon. A Container is the outermost component the Bootstrap framework knows of. Here the designer can specify the breakpoints of a web page. 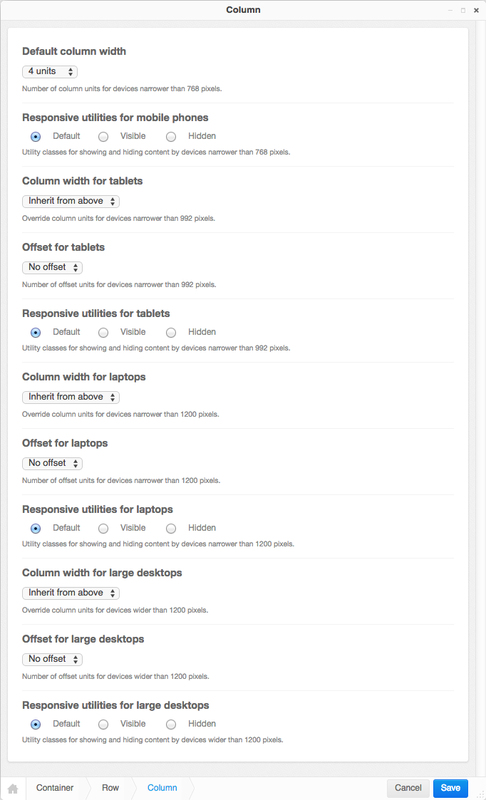 By default, Bootstrap offers 4 breakpoints: “large”, “medium”, “small” and “tiny”. These determine for which kind of screen widths, the grid system may switch the layout. The editor window for a Container element offers the possibility to deactivate certain breakpoints. While this might make sense under certain conditions, it is safe to always keep all four breakpoints active, since this gives the designer of the web page the maximum flexibility. If the web page shall be optimized just for large but not for small devices, then disable the breakpoints for Tiny and/or Small. Changing the style-sheets then is not required for this configuration setting. A variant of the normal Bootstrap Container is the Fluid Container. It can be enabled by a checkbox in the editors window. Fluid Containers have no hards breakpoints, they adopt their width to whatever the browser pretends and are slightly larger than their non-fluid counterpart. Fluid container are specially useful for Hero images, full-width Carousels and the Jumbotron plugin. When required, add a free standing fluid container to the placeholder and as it’s only child, use the picture or carousel plugin. Its content then is stretched to the browser’s full width. Each Bootstrap Container may contain one or more Bootstrap Rows. A row does not accept any configuration setting. However, while editing, one can specify the number of columns. When adding or changing a row, then this number of columns are added if its value exceeds the current number of columns. Reducing the number of columns does not delete any of them; they must explicitly be chosen from the context menu in structure view. A horizontal rule is used to separate rows optically from each other. In the column editor, one can specify the width, the offset and the visibility of each column. These values can be set for each of the four breakpoints (tiny, small, medium and large), as specified by the Container plugin. At the beginning this may feel rather complicate, but consider that Bootstrap 3 is mobile first, therefore all column settings, first are applied to the narrow breakpoints, which later can be overridden for larger breakpoints at a later stage. This is the reason why this editor starts with the column widths and column offsets for tiny rather than for large displays. If the current column is member of a container which disables some of its breakpoints (large, medium, small or tiny), then that column editor shows up only with the input fields for the enabled breakpoints. After having added a container with different rows and columns, you may add the leaf plugins. These hold the actual content, such as text and images. By pressing the button Publish changes, the single blocks are regrouped and displayed using the Bootstrap’s grid system. If a responsive image shall be placed inside a column, we must estimate the width of this image, so that when rendered, it fits exactly into that column. We want easy-thumbnails to resize our images to the columns width and not having the browser to up- or down-scale them. Therefore djangocms-cascade keeps track of all the breakpoints and the chosen column widths. For simplicity, this example only uses the breakpoint “medium”. The default Boostrap settings for this width is 992 pixels. Doing simple math, the outer left column widths gives 3 / 12 * 992 = 248 pixels. Hence, adding a responsive image to that column means, that easy-thumnails automatically resizes it to a width of 248 pixels. To calculate the width of the nested columns, first evaluate the width of the outer right column, which is 9 / 12 * 992 = 744 pixels. Then this width is subdivided again, using the width of the nested columns, which is 6 / 12 * 744 = 372 pixels. These calculations are always performed recursively for all nested column and for all available breakpoints. As the name implies, a container marked as fluid, does not specify a fixed width. Hence instead of the inner width, the container’s outer width is used as its maximum. For the large media query (with a browser width of 1200 pixels or more), the maximum width is limited to 1980 pixels.